There are probably as many different methods of making hummus as there are kitchens from Istanbul to Dubai! Sometimes, yogurt or paprika is added, not to mention the various ratios of ingredients that make for "THE one and only recipe". This recipe is stripped-down to the basic ingredients which, in my opinion, are more than sufficient to make the tasty chickpea paste. You can mix the dip using a food-processor or blender. If you want to prepare a larger amount, a meat-grinder with a grinding plate for fine cuts is a good option. Here, too, the quality and freshness of the ingredients make all the difference to the end result. Soak dried chickpeas, take some fresh garlic cloves and the best cold-pressed olive oil you can find. The rest is really easy! Boil the chickpeas (which have been soaked overnight) in plenty of water and as soon as they come to the boil, cook on a high heat for ten minutes. Then lower the heat and cook for 45 minutes more. Set aside two cups of the cooking water and a couple of chickpeas for decoration. Then drain the chickpeas. Roast the cumin seeds in a pan without fat until they begin to release their aroma. Roughly chop the garlic. Put the chickpeas, tahini, lemon juice, cumin, garlic, salt and olive oil into the blender and puree. Add a little of the cooking water to get a creamy consistency. Taste and season as necessary. Decorate with finely chopped parsley, whole chickpeas and sesame seeds if you have them, and drizzle with olive oil. 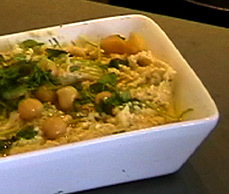 Serve with pitta bread or as a side-dish. Hummus keeps for several days in the refrigerator but should be served at room temperature.